Water, Disodium Laureth Sulfosuccinate, Glyceryl Stearate, PEG 100 Stearate, Stearic Acid, Glycerin, Decyl Glucoside, Polyethylene, Cetyl Alcohol, Phenoxyethanol, Xanthan Gum, Magnesium Aluminum Silicate, Sodium Benzoate, Sodium Polyacrylate, Ethylhexylglycerin, DMDM Hydantoin, Bisabolol, Methylisothiazolinone, butylene Glycol, Sea Whip Extract, Chamomilla Recutita (Matricaria) Flower Extract, Benzalkonium Chloride, Leuconostoc/Radish Root Ferment Filtrate, Zingiber Officinale (Ginger) Root Extract, Alcohol, Methylparaben, Disodium EDTA, Ethylparaben. Water, Butylene Glycol, C12 15 Alkyl Benzoate, Glycerin, Glyceryl Stearate, PEG 100 Stearate, Cetearyl Alcohol, Phenoxyethanol, Hydroxypropyl Starch Phosphate, Polysorbate 60, Dimethicone, Xanthan Gum, Cetyl Alcohol, Bisabolol, Tetrasodium EDTA, Ethylhexylglycerin, Methylisothiazolinone, Benzalkonium Chloride, Sea Whip Extract, Zingiber Officinale (Ginger) Root Extract, Chamomilla Recutita (Matricaria) Flower Extract, Alcohol, Leuconostoc/Radish Root Ferment Filtrate, Methylparaben, Disodium EDTA, Ethylparaben, Methyl Methacrylate/Glycol Dimethacrylate Crosspolymer. Water, Mineral Oil, Cetearyl Alcohol, Glycerin, Dimethicone, Glyceryl Stearate, PEG 100 Stearate, Polysorbate 60, Caprylic/Capric Triglyceride, Cetyl Alcohol, Phenoxyethanol, Bisabolol, Retinol, Xanthan Gum, Polysorbate 20, Allantoin, C12 15 Alkyl Benzoate, Disodium EDTA, Methylparaben, Cetyl Palmitate, Famesol, Neopentyl Glycol Dicaprylate/Dicaprate, Tridecyl Stearate, Ceramide 3, Triethanolamine, Butylparaben, Ethylparaben, Propylparaben, Isobutylparaben, Cetyl Triethylmonium Dimethicone PEG 8 Succinate, Glycine Soja (Soybean) Sterols, Tridecyl Trimellitate, Sodium Hyaluronate, Methylisothiazolinone. Used for awhile and didn't work for me. I used this product for over a year and it really helped keep breakouts at bay. I would only breakout during my period or very stressful times. But then it stopped working so well, not sure if it was because they took out the microbeads or because I might have gotten lax with the regimen, or both. Might go back to it if I can't find a better solution soon. I am a 21 year old female and I have struggled with acne since I was in the 6th grade...I started getting huge cysts on my face my sophomore year and had to take medication prescribed to me by my dermatologist to get them to go away. Once I lost my health insurance I knew my face was going to go crazy on me...so I went to the store to find a product with Benzoyl Peroxide in it (because that's what my doctor recommended) I saw this and sense all 4 of the bottles had BP in it, I decided to give it a try. I haven't gotten a cyst in almost 4 months, and my face is no longer oily. Words can't describe how thrilled I am. I barely even wear makeup anymore. Just powder! I HIGHLY recommend everyone at least try this for a month. My life is changed. I started suffering from adult acne about two years ago. It got to the point where my entire face was covered in cystic acne. I tried a bunch of home remedies and a really expensive acne system that all failed. My sister recommended acne free but I figured because of how affordable it is there was no way it could fix my acne. 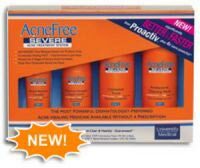 I decided as a last attempt with an acne system before going to a Dr to try acne free severe. I'm not kidding, within a week my face was clearing up. I've now been using it for 3 months and my face its totally different. I still get a pimple here and there but nothing like before. It's a great feeling being able to rub my hand on my cheek and not feel a bunch of bumps. I don't use the toner because for some reason it breaks me out. I'm sure it's different for everyone though. For the price I recommend anyone with acne to give it a try. This is my personal experience, i bought this product at my local drug store, last November of 2013 as i went into the 2nd week i had notice these "CYST" appearing all along my check area jaw line, and forehead i was torn. I do not recommend this product to any of my close friends and family. I consist of Oily, acne-prone skim, i'm a guy so...... yea. I was skeptical at first, then after about 3 days....dried up ALL my acne & started to smooth and tone my skin. Great product, must try, I mean i didn't have severe but it said severe on the pack so I figured it would work for me. I love this kit.!!! I've tried everything. from an all natural skincare routine to a store bought skincare routine. I've low-end drugstore products like neutrogena to high-end products like proactiv. This is the only thing that seems to work for me. It doesn't dry out my skin but I do have oily skin so I don't know if I would recommend this for dry or combo skin types. I had pretty bad acne and with in two days its almost completely cleared up. LOVE this kit!!! It's amazing. I just can't get over how clear my skin is now. Cleared up my acne Easy step process Dries your skin sometimes skin is itchy I have tried insanely many products and my face would always wake up with new acne. I decided to use this product and I began to notice that my acne was disappearing and now I don't wake up with new acne. Im astounded because Ive used benzoil peroxide products before. The only thing is that I have to put on dry skin lotion after I use this daily. Since using this, I rarely get acne. This might not work for everyone but it did for me.